The following treatment falls into a specific domain of treatments of art, between art and philosophy. It is not a piece of art history, for it does not place works of art in the context of art history or an art scene, but instead allows the works discussed to modulate philosophical sensibility, as if playing a piece of art on a philosophical instrument, so that the outcome is driven by both. 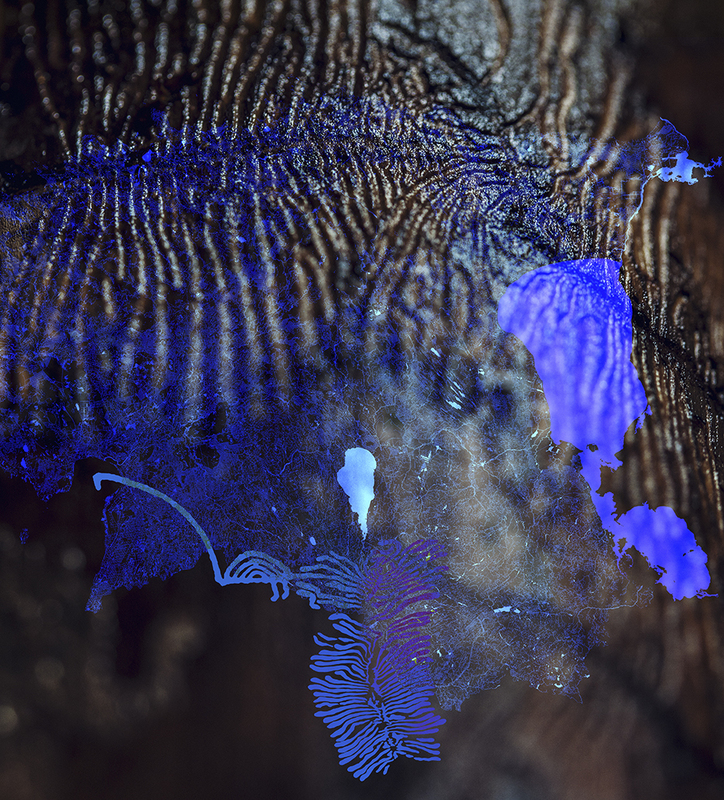 I will describe two very general concepts – those of energy and veining (referred to by the phrases “fly agaric” and “bark beetle” in the title) – and will then unravel some aspects of Peeter Laurits’ poetics and technique. Although the account will remain undone at the edges, in the sense that more and more new aspects seem to be woven into them, the unfolding of which could fill a whole book, or a library. There are two aspects to being-in-potency*: pattern or “veining” (li 理) and energy, power (qi 氣). Peeter Laurits uses various images to represent these; among the most suggestive are the fly agaric and the galleries of bark beetles. 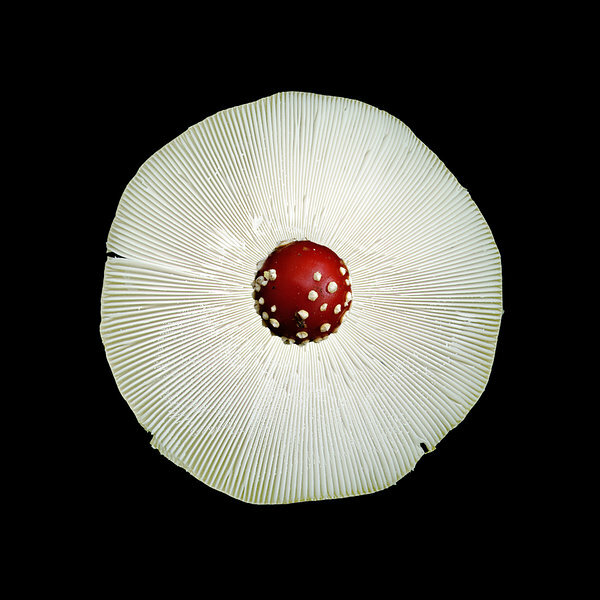 His “Taevaatlas” (Atlas of Heavens, 1997–2002) consists of a series of images of fly agarics, both from above and below. 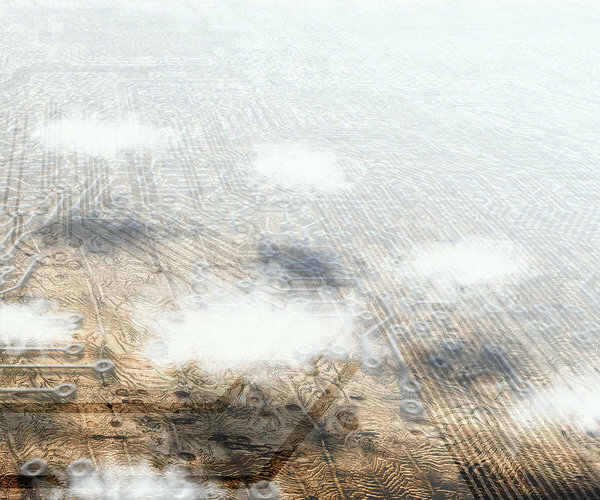 These are combined with various other images. The connecting elements are the starry sky in the images viewed from above (the spots on the mushrooms become celestial bodies: stars and asteroids) and the eye in the images viewed from below (the gills look like the retina and the stem resembles the pupil). These are inseparable aspects: the observer and the observed (the observer is left out of, remains implicit in, sky atlases, and atlases in general). 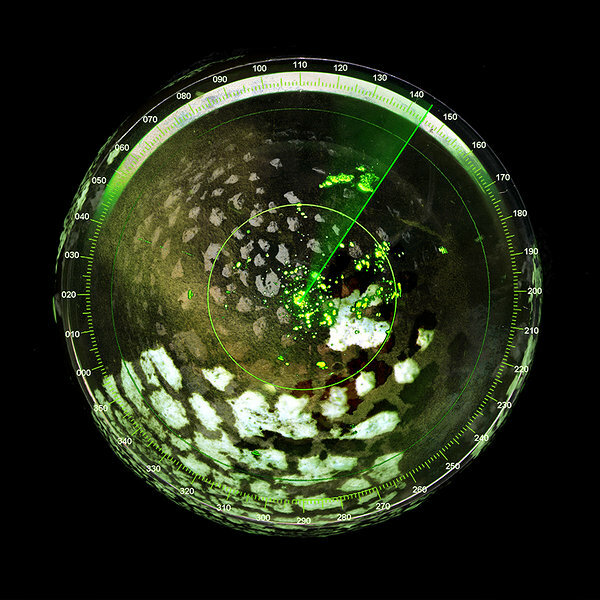 Both pairs are, in turn, combined with various other images: a radar screen (“Taevaatlas” 38, 40, 2008), a Chinese geomantic compass (“Taevaatlas” 6, 1998), the heart as an organ (“Taevaatlas” 20, 2000) and the Moon as a celestial body (“Taevaatlas” 31, 2003) and so on. As a rule, the background is black, like the night sky. There are two aspects here: the external (both the natural and the technological, both the imaginary and the symbolic) and the internal (organs, hearts, nuclei and egg yolks) and these are mediated by the fly agaric with its two sides; or, to put it another way, the fly agaric with its two sides embodies these two aspects. The fly agaric, however, is a source of potency, an aid to shamans; it shifts worlds and opens up new dimensions within them. The emphasis here is on energy, power and acceleration (or deceleration). There are, however, certain patterns within this, either (semi-)circular quasi-regular white spots on the cap of the mushroom or the radial gills under the cap – the fly agaric has a veining, a set of paths of its own. The fly agaric makes you look at the world sub specie amanitae, through the fly agaric, through being-in-potency. Being-in-potency is where the veining is more interpenetrated and power is less impeded than in being-at-hand, or the world of juxtaposition. The fly agaric melts the world down in a way that adds power to the flow of life sap, brings the lifeless to life, stops the symbolic from causing anguish or oppression and instead makes it flow into the mysterious (which in Laurits’ other works is represented by means of hazy images and muted colours). In some more recent works, the aspect of power (or being-in-potency as a whole) seems to be represented by an Yves Klein blue, which gives the photographs a special glow, intensity and depth. 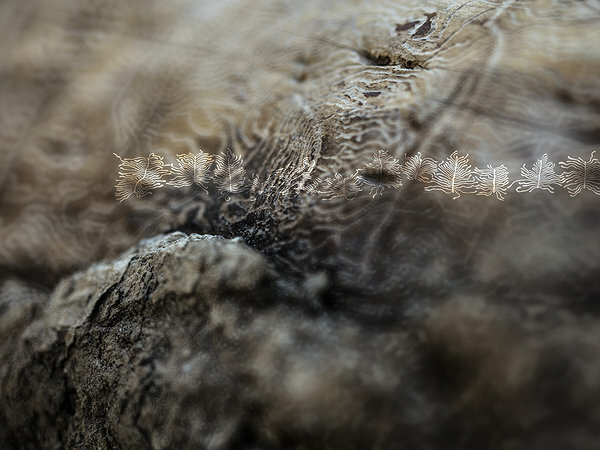 In the series “Logos & Mythos” (2013) and “Codex naturalis” (2015)1 this kind of communicative ground is constituted by the tracks of bark beetles. The emphasis here is on veining (a pattern of tracks or paths), but energy and power are also present: the primal force, the ever-emanating potency with which the bark beetles bore through the wood.2 The beetle tracks are also superimposed on various objects: microchips, processors, metro maps, belt patterns and electrodes measuring brain activity.3 On the one hand, this might suggest that such technological inventions (textiles or even more recent scientific and technological achievements) are not all that far removed from natural structures. 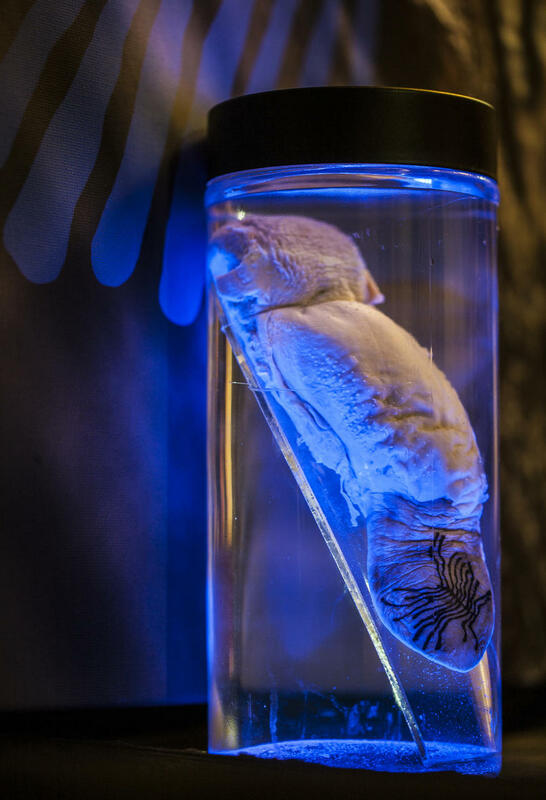 In other words, the same potency has produced the beetle tracks and microchips, using different means to create certain structures and patterns. One day my five-year-old found a stick with bark beetle tracks on it in a pine grove near Tallinn University of Technology and asked me whose writing it was. I was taken by surprise; we had never discussed the writings of bark beetles before. So I said that it was the writing of bark beetles. To which she replied, “I want to learn the writing of bark beetles!” I approved, and on reflection realised that she in particular should know the writing of bark beetles: grown-ups are more unequivocally channelled into man-made patterns, while children may be able to move between different patterns, veinings and writings with greater plasticity, bringing together bark beetles, Chinese signs, alphabets and whatnot. We begin to grasp this “other” from the perspective of the bark beetle, sub specie scolytidae. This terrible unfamiliarity does not imply that we enter the indistinguishable; instead, it means a shift – channels, grooves, paths and veins of a different kind. 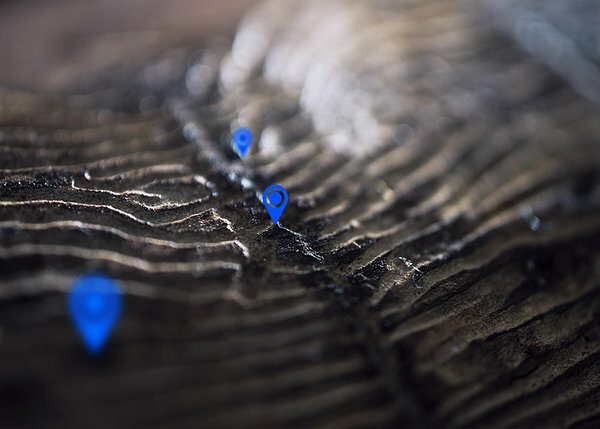 Through these we are better connected with the flows of nature; through the tracks of bark beetles, fresh waters of life flow to us. Nature is first and foremost not an object to be stared at; it is becoming, physis in the sense of growth, phyo¯ or “so of itself”, ziran 自然, movement from interpenetration to juxtaposition, from flow to solidity. Bark beetles, then, are a point of reference through which we are able to move back to an interpenetrating pattern and flowing power. Laurits’ pictures time and again offer connections between body, culture and nature. The body joins with various other beings. In the series “Mullatoidu restoran” (Dining with Worms, 2004) with Ain Mäeots, they even take revenge on the human body: the body is fed to the fish (“Kalatoit” (Fish Food), 2004) or a dead elk (“Märter ja Bambi” (Martyr and Bambi), 2004), it gets pierced by feathers instead of arrows (“Linnud jutlustavad pühale Sebastianile” (Birds Preaching to St. Sebastian), 2004) and poppies take vengeance on it (“Moonide vendetta” (Vendetta of Poppies), 2004). 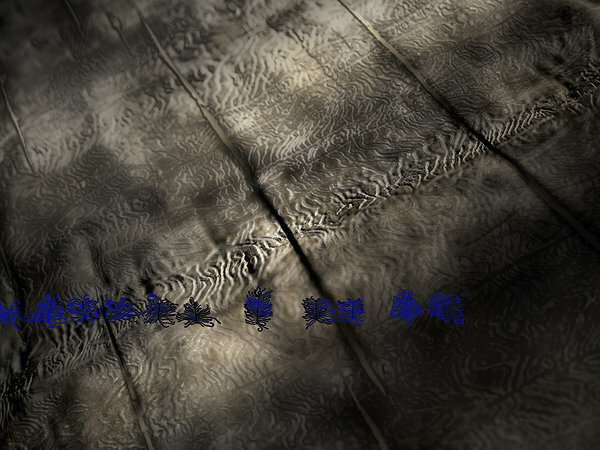 In a similar vein, artefacts and symbols are brought together with nature: the architectural elements of different historical periods and places (“Suur pauk” (Big Bang), 2006), a Chinese character 閟(“Pelgupaik” (Refuge), 2012), a NASA space capsule (“Taevalik saadetis” (Heaven-send), 2003), Brueghel’s tower of Babel (“Kosmose pesumaja” (Cosmic Laundry), 2002; “Väga suur narratiiv” (A Very Big Narrative), 2002; “Taevalik kindlus” (Celestial Fortress), 1999), anatomical educational tools (“Õhtumaa hommik” (Occidental Morning) 1 and 2, 1999), Mandelbrot-type images (“Öö seierid” (Pointers of the Night), 1999), etc. However, it is not so much these cultural symbols that give meaning to the background as it is the background that gives meaning to the symbols by serving as a genetic ground for them and as a place where the bodies return. The potency and energy of the mushrooms and bark beetles open up new worlds and times through the veinings. All ages join together in being-in-potency, as they do in the picture “Euroopa pärast vihma” (Europe after the Rain, 2005), where an ancient tree is set against the background of natural formations (a swarm of bees on a strip of honeycomb, a wrinkled mushroom of some sort and a series of some kind of bulging formations) and cultural artefacts (Egyptian carved sculptures, a figure from an ancient temple, a fragment of an Islamic minaret, a Gothic rose window and numerous other types of fenestration that melt into one with the hollows in a tree). Here the wood (with its grain and veins) performs the function of the veining of being-in-potency; it carries in itself all times, as well as both people and insects and the rest of life. It is as if the small black window or door openings are passageways into potency, compared to which a nuclear mushroom cloud is but a wormy little toadstool, a tiny manifestation that belongs within the same order of things as the quasi-fungus in the Gothic rose window (“Suur pauk” (Big Bang), 2006). The nuclear mushroom cloud, of course, has its apocalyptic aspect, as in the series “Tuumatalv” (Nuclear Winter, 2006), where the title suggests that the landscape has been turned into desert, although visually it does not strike one as apocalyptic. The background is hard to define here; it could be either a landscape photographed from a high altitude or cracks in a puddle photographed at a microscopic level – in other words, a certain veining again. The focus of the picture is on a vehicle, which in a couple of pictures seems to be taken from an old cave painting or some ancient image, but in most of the pictures is actually a plastic comb, transformed to different extents, which has lost some of its teeth and/or has deformed through melting (in one of the pictures a partially melted hair clip). This coloured comb-vehicle stands out against a practically black-and-white background and allows one to travel through different ages, at least from the Stone Age to the modern day and onward. As with the fly agaric, it allows you to shift and melt the world and its chronological sequence down and travel to another location, within another temporality. Clear/blurred is related to individuation in the broadest sense: all our “clear” ideas and perceptions are made up of a large number of smaller events by drawing them together and fusing them into one. These distinctions will remain blurred for us – but this is precisely the genetic ground from which we stem as individuals. To borrow more terminology from Gottfried Wilhelm Leibniz, an individual is a certain “view” of the world: each individual (monad) expresses the entire world, but necessarily does so from a distinct point of view that brings to light certain things (the points, as it were, important to us that make up our lifeworlds) while leaving all the rest concealed. The genetic grounds of different individuals, however, are tightly intertwined with each other like a network of roots and fungal mycelia. In Laurits’ photographs, the out-of-focus parts of the picture help represent the unrepresentable, the implicit, the obscure, the genetic ground, in other words, the life force and veining. The bright/muted distinction primarily modulates feeling and represents variations in intensity. It expresses individuation in a slightly different way, in terms of the levels of intensity or the presence of energy. The bright/muted can then be understood in two ways. First, so that the distinction relates to the field of tension of a given individual so that the bright represents a high level of intensity of power and the muted a low one. On the other hand, it can also be understood as relating to the individual and individuation itself, so that the muted represents power as being in potency and the bright represents power as being at hand. In the latter case, the muted represents an individuation field where the forces are only just beginning to organise and contract into an individual. These productive differences fuse into one in the actualised individual (in brightness). As photographs, like dreams, are over determined, these two readings are not necessarily in conflict: on the one hand, the muted is the pre-individual, while the bright is the individual, but at the same time, the field of intensity constituted by the muted and the bright may be read as the intensity range of the existence of an individual, which manifests itself in the variations of the intensity of feeling from low to high intensity. The differences clear/blurred and bright/muted give Laurits’ pictures a special depth. One gets the feeling that if the photographs were magnified, ever new images would appear, endlessly varying from the original one. It is as if they were endlessly folded, labyrinthine – even those where the focus of attention seems to lie elsewhere, such as “Mullatoidu restoran”. We anticipate that endless new perceptions can be derived from the haze. In this way, limited means can be used to represent the limitless. (to use Spinoza’s word) hilarity. “For fairly many people my pictures are pessimistic and eerie,”8 Laurits has said, surprisingly. That is to say, I myself cannot see the negative in these pictures. On the contrary, what is oppressive and eerie is the narrowly human reality where culture may easily imprison us. Laurits, on the other hand, opens up this narrow perspective, shifts it out of place, melts it down and makes us move from the products to the potency that produces them. For example, “Kosmose pesumaja”, where the tower of Babel familiar from the painting by Pieter Brueghel the Elder is placed in the middle of a firmament that at the same time looks both like an expanse of water and galaxies in space, while the cylinder of the tower resembles the drum of a washing machine. Indeed, the tower, or the human world, is another form of the cosmic swirl; and what is important is not so much the shape it has as the intensity it produces. It gives power and cleans the veins; it shifts, engages and disengages clutch in a different way, opens up the capacity for perception and refreshes the capacity for feeling. Let us return to symbols. Usually the development of symbols is represented as an evolution from the lower to the higher, from icons to indexes to symbols. In Laurits, however, this kind of hierarchy either disappears or at least he shows how complex signs are enfolded in simpler ones: this way cultural signs are embryonically already there in natural signs. For example “Putukate kakemono” (Insect kakemono, 2014), which apparently shows a blackberry (although it very much resembles the compound eyes of an insect) and a sequence of numbers in a circle at the centre. To begin with, the title here combines nature and art (kakemono is a wall-mounted Japanese ink painting). 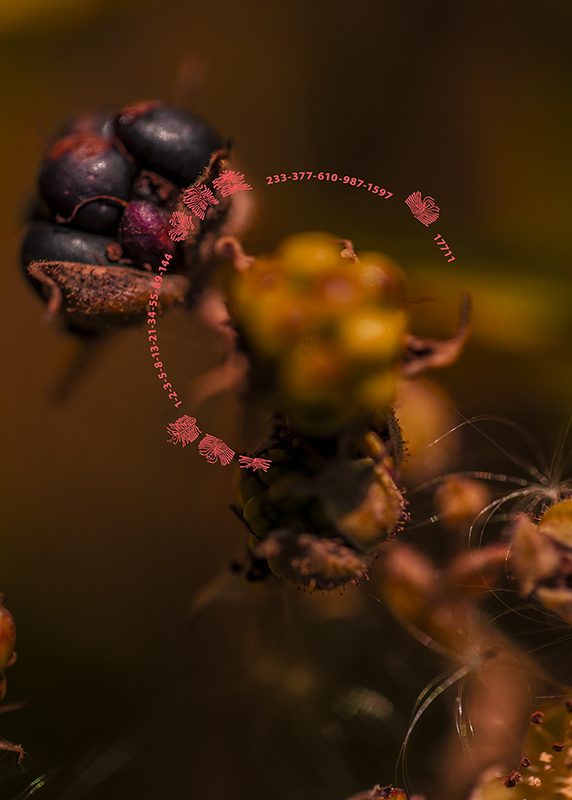 But this entwinement is also revealed by the picture itself, where a sequence of numbers forms a little more than a semi-circle around an unripe blackberry, with images of bark beetle galleries inserted between the numbers like hieroglyphs. The sequence consists of Fibonacci numbers (where each subsequent number is the sum of the previous two: 1, 1, 2, 3, 5, 8, 13, 21, etc. ), which firstly have applications in information technology and elsewhere in science (the Fibonacci heap, Fibonacci cubes, etc. ), secondly, the sequence can be used to describe various natural structures (ferns, pine cones, artichokes, etc. ), and thirdly, it is closely connected to the golden section (each subsequent number divided by the previous number in the series is approximately equal to the golden ratio), which is a root phenomenon in art and aesthetics. These three domains (the numbers as representatives of mathematics, the berries as a piece of nature, and the photograph itself as a work of art; plus the alternation of the numbers and bark beetle hieroglyphs) are tightly intertwined. Numbers also make an appearance in “Sigimiku ruuter” (Router of Ovary, 2015). The top right corner of the photograph shows a table of hand gestures with corresponding numerical values (taken from a manual published in 1520). At the centre of the photograph is a large image of a hand that seems to come from the treasure trove of Renaissance art and in turn grows out of a wooden “arm” that has been worked on by bark beetles. 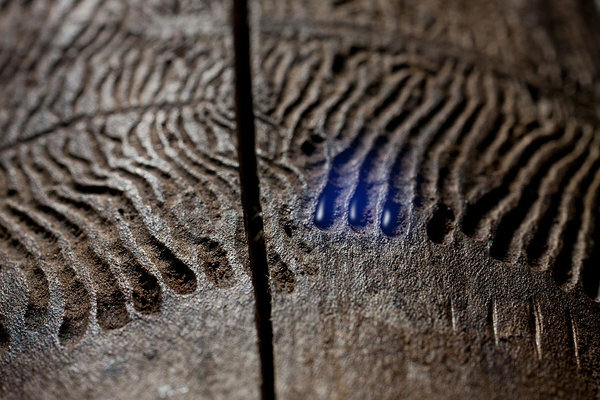 In the background of the photograph are galleries of bark beetles, into which the fingers of the hand are pressed. 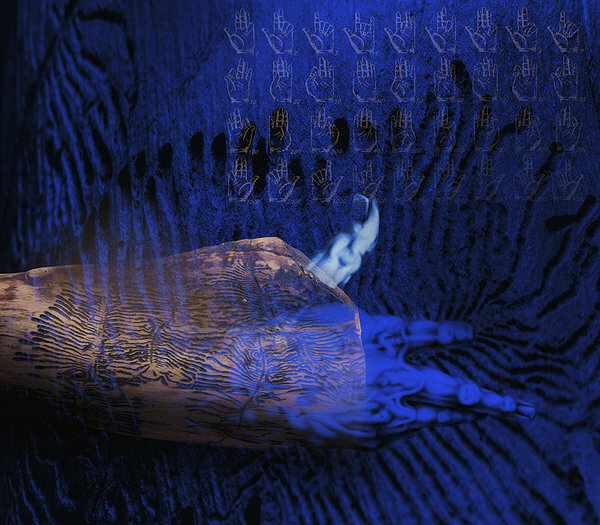 The photograph has a Klein-esque blue glow. In botany, “ovary” means the part of a flower that contains ovules; “router”, on the other hand, is a term in modern technology for a device used to connect computer networks. Here, too, mathematics, nature and art are brought together and spread out their potency of being, which lies in the “ovary”, distributing it along the veinings, either natural or artificial. Networks are another recurring motif in Laurits’ work. I mentioned earlier how bark beetle tracks are combined with technical networks (like microchips or metros) in several works. Networks hold an exceptionally important place in thinking upon the power and veinings described above. As a rule, a veining is a network, which means that when power mounts along the network, non-linear effects almost always occur: the actualised affects the actualisation, and the network takes on emergent properties; that is, through its web-like structure and communicative channels alone it can yield very complex overall behaviour by applying simple means and rules – and all the more so when different networks intercommunicate. One of the most interesting developments of the concept of a network is based on the map of Estonian waterways with the lakes and rivers highlighted, once again in that Klein-esque blue; e.g “Vooluvõrgud 2” (Waterway Weaves 2, 2014). This is the water veining of Estonia, the blood vessels of the earth, as it were. Once again they are superimposed on bark beetle tracks. With the added image of a water bird from a cave painting, the work harks back to the very distant past. The lines bored by the beetles merge directly with those drawn by the pre-historical artist. One can also think in the same vein about the platinum palladium prints “Juured” (Roots, 2015) and “Võrgustik” (Network, 2015). We know that the roots of plants are tightly interconnected and form various symbiotic associations with fungi and bacteria. Therefore, the roots of plants have been assimilated with a plant internet; plants use their roots to exchange information.9 “Roots” only shows roots; they are not only in the service of the plant tops but have intrinsic value as basic communicative channels. A root does not stand for “a unique source of an autonomous subject” here; instead, a network of roots is a field of subjectivity or individuation, from which, here and there, grow “tops” (like mushrooms on fungal mycelia), which appear separate on the surface but are interconnected with each other and other organisms below the surface. This might help us interpret roots in a more metaphorical sense; for example, in the works “Uural 1–3” (Ural 1–3, 2015). At least for a certain generation this is instantly reminiscent of how “we” came from the Urals to Estonia five thousand years ago, so that the Urals are strongly related to our national roots by connotation. 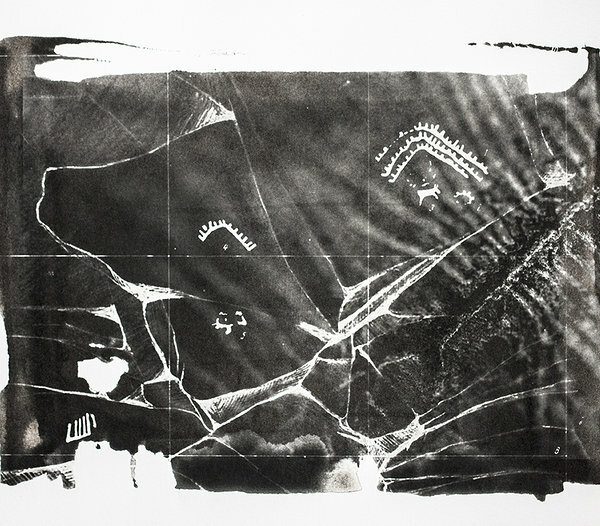 These photographs also contain fragments of old cave paintings, which Laurits often uses (and which in some of his pictures resemble the structural formulae of chemical compounds). However, in the “Urals” it is not the “language tree” (or the related image of a pedigree) that glows through the pictures, tapping its vertical primary root into the Urals, but a multitude of flow channels (beetle tracks). The roots spread out horizontally and connect heterogeneous individuals. The Urals are like a furrow. Laurits has always been in close touch with cultural heritage, both in his works and their titles, but not with the purpose of turning it into museum exhibits; instead, he has aimed to shift it from its place, to create new connections and in this way give it new life. Lineage is not exclusionary here; it does not close out or smother; instead, it is outreaching, liberating and creative. The exclusionary use of lineage is when some elements of heritage are sacralised in such a way as to cut it off from the flow, or the movement of power, so that they start to oppress and smother this flow and movement. The inclusionary use of lineage, however, is when the elements of heritage are connected with each other and nature, so as to amplify and broaden the movement of the flow. The “Urals” and other works by Laurits cannot be used as a platform for an angry and militant closed community; instead they promote inclusion – the whole of nature and humanity, seen precisely from the particular space-time and cultural position where it is currently at, fits in those furrows in the Urals (in the sense that the Aborigines have different “urals” of their own, in which we too fit). Bark beetles also provide us with a philosophical or existential chart (in a topographical sense), as it were, especially in “Sünteetilised pihukirved” (Synthetic Hand Axes) subtitled “Highway BB 881” and “Highway BB 883”10 (2014). 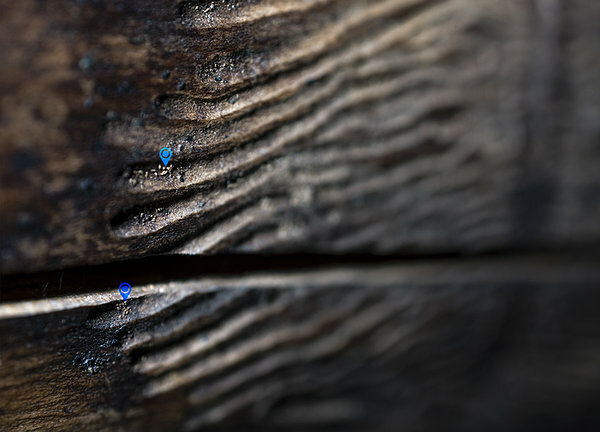 These pictures show powerfully magnified images of bark beetle galleries with the inverted-drop-shaped location marks familiar from Google Maps pinned on them (“BB 883” almost in top view and “BB 881” almost in side view). In “BB 883”, two location symbols minimalistically convey a difference. Our state is characterised by a certain location in an x-dimensional space (the dimensions of which correspond to the significant parameters of the lifeworld of each person), which is spread out over a cosmic veining, the tracks of primordial beetles. And these positions are not unequivocal, but always involve a tension between at least two different points. We are already elsewhere, still here, etc. Time, or duration, means precisely that we cannot identify with a single point in space. And we are likewise never just “I”, but always in some tension with “you”, the other. In “BB 881” additional meaning is invoked by the fact that out of the three location marks only the middle one is clear, while the other two – the one closer to the viewer and the other further away than the middle one – are blurred, out of focus. What I said about the clear and the blurred above is also relevant here and can be applied to time: the past and the future are blurred; they contain numerous distinctions that for us are fused into the one “clear” present moment. This clarity, however, feeds on the blurred genetic ground and the power circulating in it. Laurits’ work time and again shows an aspect that I am unable to find a good word for. I will call it a “shaught” (pronounced like “shaft”), which is a portmanteau of the words “shift”, “laugh” and “fault”. I said earlier that Laurits creates shifts within his works, but he also does this at a more global level with respect to his works and exhibitions. It seems to me that a “shaught” by Laurits is joyful without being jubilant; it is positive without being starry-eyed. He once remarked on “Mullatoidu restoran” that they wanted to show “the possible consequences of an ecological crisis and the probable scenarios of human extinction. In order to avoid dreary pathos on this topic, we dramatise it at the level of the individual using a grotesque and optimistic approach to the topic, taking our cue from a rebudding nature”11. Laurits’ works often have an important critical aspect, at the level of society, humanity and the environment (especially in “Viimne õhtusöömaaeg” (Last Supper), 2003, created with Ain Mäeots), but his horizons are not limited to social or environmental issues; he does not get stuck in these. Potency itself cannot be diverted, only impeded. It is precisely these impediments that Laurits points our attention to (be it a fossilised metaphysics, over-consumption, the pollution of nature or something else), without stooping to moralising, for part of his attention continues to be on productive potency, power and veining, on pure production. Laurits avoids moralising by using, among other things, the grotesque approach mentioned above, which brings us back from the meta-level to the original level, in a new way. 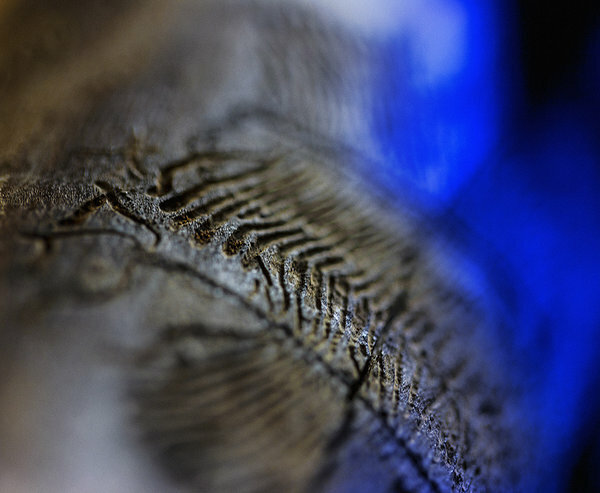 The “Codex naturalis” series also contains works where bark beetle patterns are tattooed on pigs’ tongues, which were held in jars in a solution and also made available for sale. These works can be interpreted in a variety of ways, but in any case they trigger affective responses (the tongues can feel horrifying to look at). Shaughts like this provide a means for melting down impediments at a different level: not only as refreshers of ordinary perceptions and feelings, but also as shifters and shakers of pre-existing interpretative schemes, or those acquired while viewing the exhibition, which allow us to become aware of the undefinable and ever-shifting mystery discussed above. This encourages “free roaming” (xiaoyaoyou 逍遙遊), to use Zhuangzi’s phrase, which is characterised by an unimpeded power and abundant veining. * In this paper the term “being-in-potency” is to be taken more or less equivalent to Deleuze’s “virtual” and “being-at-hand” as equivalent to his “actual”. – Author’s remark. 1 Both are part of a large project with the general title “Codex naturalis”, under which more events are forthcoming. 3 In this respect, Laurits’ project seems to be congenial with the Eeter group (consisting of Anna Hints, Marja-Liisa Plats and Ann Reimann), who played music at the opening ceremony for the “Codex naturalis” show, combining primaeval voices with electronica. 4 See Peeter Laurits, Kahe ekspeditsiooni vahel. – Overall.ee kool 1. VIII 2015 (https://www.overall.ee/uudised/Overalli-kool-Peeter-Laurits-kahe-ekspeditsiooni-vahel?newsId=642). 6 In this way Laurits’ work gives prominence to both line and colour – the relative importance of which used to be a subject of fierce disputes in Western art criticism – although in an altogether new sense, as instruments of implication. 7 On the distinction of the clear-confused and the distinct-obscure, see Deleuze’s reading of Leibniz in Chapter IV of his “Repetition and Difference” and “The Fold: Leibniz and the Baroque”: Gilles Deleuze, “Différence et répétition.” Paris: PUF, 1968; Gilles Deleuze, “Le pli. Leibniz et le baroque”. Paris: Minuit, 1988. Deleuze’s lectures on Leibniz are also worth reading. 8 Peeter Laurits, Sild sinna ja tagasi. Tallinn: Eesti Keele Sihtasutus, 2012, p 56. 9 Dan Cossins, Plant Talk. – Scientist 1. 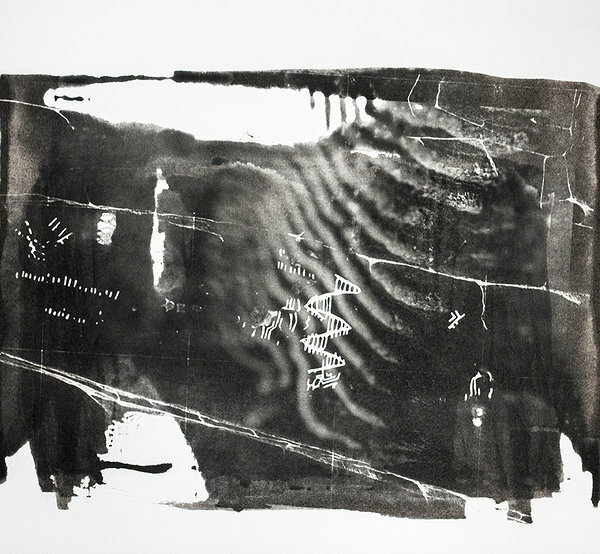 I 2014; Zdenka Babikova; Lucy Gilbert; Toby J. A. Bruce; Michael Birkett; John C. Caulfield; Christine Woodcock; John A. Pickett; David Johnson, Underground signals carried through common mycelial networks warn neighbouring plants of aphid attack. – Ecology Letters 2013, 16.7, pp 835–843; Yuan Yuan Song; Ren Sen Zeng; Jian Feng Xu; Jun Li; Xiang Shen; Woldemariam Gebrehiwot Yihdego, Interplant Communication of Tomato Plants through Underground Common Mycorrhizal Networks. – PLoS ONE 2010, 5(10): e13324; Nic Fleming, Plants talk to each other by using the internet of fungus. – BBC, 11. XI 2014. 10 According to Google, these highways actually exist in the US; one is Deepwater Highway and the other Deerfield Highway – beautiful names behind the codes. 11 Peeter Laurits; Ain Mäeots, Mullatoidu restoran. Synopsis (2004). – http://www.metsas.ee/et/kunst/peeterlaurits. My name is Aly and I would like to know if you would have any interest to promote your website here at peeterlaurits.com on our blog alychidesigns.com ? I am looking for people/businesses that would like to contribute promotional or helpful articles to our blog. If you are willing to post on our site, we would post an promotional link within the article as well as an (optional) author link.